Sen. Bernie Sanders and Rep. Keith Ellison on Thursday introduced legislation to end billions of dollars in oil, coal and gas subsidies. 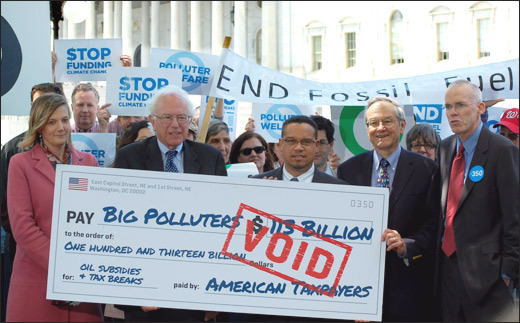 "We are here today not just to announce new legislation, but to send a message that it is time to end the absurdity of taxpayers providing massive subsidies to hugely profitable fossil fuel corporations," Sanders told a news conference outside the U.S. Capitol. "In these difficult economic times, it is imperative that we support the taxpayers of this country and not the fossil fuel industry - one of the most powerful special interests in the world," he added. Joining Sanders at a news conference, Ellison noted that big oil companies make more than $300 million every day. "Why should Americans prop up these companies with tax dollars and have to pay ridiculous fuel prices?" he asked. "We need to get off the fossil fuel bandwagon that keeps us dependent on oil and contributes to climate change. The $113 billion in taxpayer handouts that oil, gas, and coal companies receive should be used to invest in green jobs. It's time for this corporate welfare to end." Doing a little quick research online, I found the following: The net profit for the first quarter of 2012 for Chevron was 6.471 Billion Dollars. The net profit for the first quarter of 2012 for Exxon Mobil was 9.45 Billion Dollars. This was not the gross profit, it was net. I did not find the quarterly report for BP, but for the full year of 2011 the net profit for BP was 26.097 Billion Dollars. Again, this is net not gross. In all three cases it is billion with a B.
I do not object to companies making money. If they can make a lot of money, that's good too. But, subsidizing their profit is where I have a problem. They should be taxed like small companies are. Speaker Boehner and the House GOP are sure to block this legislation. But it is good that Senator Sanders of Vermont and Representative Ellison of Minnesota are offering the legislation. Better would be seeing it pass.